How much tougher will things get for Vale and the world’s other large iron ore mining companies, as prospects for the Chinese economy deteriorate, while the production of ore booms? For the past 15 years or so, the top priority of the world’s leading iron ore mining companies, notably Vale, BHP, and Rio Tinto, has been to keep pace with the frenetic rate of growth in demand from steel mills in China. The response by Vale and companies with mines in Australia has been to seek to open more, bigger, better and lower-cost mines, as well as to invest in infrastructure to get the ore to markets more cheaply, and to push out higher cost competitors by this means. destination of two-thirds of the ore shipped by sea and spurred by numerous major infrastructure works, as well as by fast growth for industry and housing, would continue if perhaps not for ever, at least for several more decades. But for various reasons, the main one being that massive financial pressures created by the pace of growth have become a threat to the whole edifice, the Chinese government is seeking to switch away from investing in infrastructure, to encouraging the faster growth of consumerism. This means less steel will be needed than hitherto. There is another important variable as well, which is that far sooner than was anticipated by the planners, large quantities of scrap metal are beginning to become available in China. The country is now the world’s leading market for motor vehicles and the first generation of cars made there is now being scrapped. The use of scrap, rather than iron ore to make steel, is a well known phenomena in many countries in the developed world and has resulted in a sharp reduction in the use of ore there. Keeping pace with the steady increase in the demand for iron ore by China, which grew by more than 20% each year for almost 20 years, has been the main priority of the mining companies, both in Brazil and elsewhere in recent years. China’s burgeoning steel industry, now responsible for about 50% of the total world production of steel, has struggled to keep pace with a rate of growth which often exceeded 10% a year. The country spent huge amounts on constructing a brand new infrastructure, on building up its industry and on building new homes for the tens of millions who migrate from the countryside to towns and cities each year. Demand for ore frequently exceeded supply, which encouraged prices to rise, which as the numbers in the first table illustrate, quadrupled in less than ten years. an estimated 7–8% in the past few years (some observers think this is an over-estimate) and with the huge rail network virtually complete and a huge stock of unsold housing building up, the government has decided to give more emphasis to consumption, rather than investment from now on. At the same time, the economies of many countries which have bought huge volumes of Chinese-made goods in recent years have been slowing, so China’s exports have been falling as well. The end result is that rather than there being one overriding concern for China, growth, the situation has become far more complex, in some cases, contradictory. The past couple of years have seen the world price of ore fall steadily, to stand at less than $50 a tonne in recent months, less than half the record $100 per tonne reached two years ago. This is below the cost of production for all but the most efficient mines. Estimates about what will happen to prices from now on and when, vary enormously. It is not entirely clear what the effect a price which is frequently below the cost of producing ore, or equally importantly, transporting it by sea to steel mills in China, might have on mines in different places and with different cost and ownership structures. Five years ago, mines in China themselves produced more than 300mt (million tonnes) of ore, slightly more than half of all the ore used to make steel. This was despite most of the local ore having substantially less iron content than the 60%+ of the ores coming from mines in Australia and Brazil. Now, less than 200mt are mined in China, after a series of mine closures. The question now is whether the recent falls will continue. The ‘big three’ miners, as well as consultants, calculated that most of the high cost mines in China would cease production if prices fell to near $50 a tonne, as this would make them unprofitable. Some mines in China have indeed closed, with the result that about two thirds of all the ore used in China is now being imported. But the fall in local output has not been as fast as many analysts anticipated and it is unlikely to do so any time soon either. 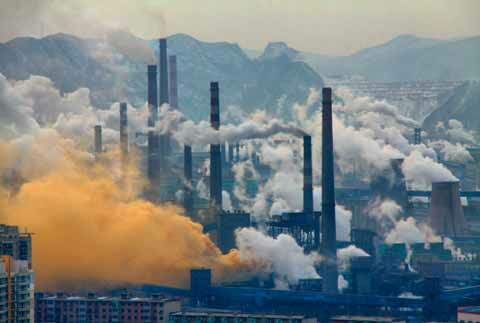 As in Brazil, many mines in China are owned by the steel mills which they supply, so may be cross subsidized. Some steel mills are state owned, others are owned by powerful local authorities which may be prepared to subsidize production to keep people in work, at least for a while. Another important variable is that the pattern of steel production in China is likely to gradually change in the years ahead. Most steel in China continues to be made in traditional blast furnaces, using mainly low quality and very polluting coal as fuel. But air pollution in many parts of China has become so acute that numerous coal mines are going to be obliged to shut down. This is likely to mean that the steel mills they supply will cease operations as well. It is expected that mills which now make about 30mt of steel each year, the amount produced by Brazil’s entire steel industry, may shut down in the next few years, so substantially less ore will be needed. Many had predicted that, sooner or later, China would be obliged to switch to start giving priority to consumption, rather than continue to invest in more capital goods. But the ‘big three’ companies seem to have paid little attention to this, and they have all invested in adding massive new capacity. They are all relying on being able to cut prices to below those of the competition to allow them to survive and prosper. Rio Tinto and BHP have opened large new mines in Australia, as has Fortescue, while Vale will start producing up to 90mt of extra ore from its new mines in the Carajas complex in a year or two’s time. Most of these mines can produce ore for less than $45 per tonne. Vale hopes that the extra ore from Carajas will mean that China gets 15% of all the ore it imports from Brazil in future, rather than the 10% it now does. To keep the average price down, production in Vale’s higher- cost mines in Minas Gerais state is to be reduced by 30mt, while at the same time,Vale is to sell various assets, including coal mines in Mozambique. Last year for the first time, more ore left from the Ponta da Madeira port at Itaqui from which Carajas ore is shipped, than from the Tubarao complex. This trend will continue in the years to come, which will affect the shipping pattern. Investments being made at Itaqui will permit three 400,000-tonne-capacity Valemax ships to be loaded there simultaneously, as new berths are built and latest-generation shiploaders are installed there. Less ore will be shipped from Tubarao on the other hand. which ore prices are set, in the past couple of years. With Brazil’s economy struggling, the currency, whose excessive strength penalized Vale and other exporters for several years, is unlikely to rise again any time soon. Anglo American directors must greatly regret falling for the charms of mega-investor Eike Batista, son of a previous Vale chief executive and paying much more than its Minas-Rio mines were worth. Anglo is looking for a partner to take a share in the project. But dozens of projects, which had they come to fruition, would have added another 250mt to the amount of ore produced worldwide, are now on hold, many of them are up for sale. So Anglo will be lucky to attract a buyer, except at a give away price. Vale was able to push up the price at which its ore was sold on the domestic market as the world price soared. This encouraged most of Brazil’s steel mills, which between them use about 60mt of ore each year, to set about opening, or enlarging mines they themselves owned. Some even began exporting ore, which in some cases earned them more than their exports of steel did. But circumstances have changed once again and although the weaker Real means exporting has become more profitable, it also means that the amount of steel imported by Brazil has fallen sharply. Fifteen years ago, China was not amongst the top ten importers of Brazilian ore, but it now takes almost two-thirds of it. Japan was the leading customer until the mid 1990s, while several important European steel producing countries, as well as the United States, were also important markets. Virtually no ore was sold to countries in the Middle East at that time. But the amount of ore sold to Japan, Germany, France, Italy, Belgium, the UK and Spain has fallen sharply in the past 15 years, while that going to the US has collapsed. Only some countries in the Middle East are buying more. One of the main causes of the falls has been that the increased availability of scrap steel and the advance of new technology, as well as greater concern with pollution, has encouraged mills to cease making steel in huge blast furnaces. Most have switched to using electric furnaces, which handle scrap instead of ore. In the past few years, China has become the world’s leading market for cars and many consumer durables, which means that the amount of scrap available there is now growing fast as well. How long will it be before China too, starts to cut the amount of ore it needs, with the result that the gleaming new mines, many highly automated, in Australia and Brazil may never fulfill the potential their investors thought was guaranteed!